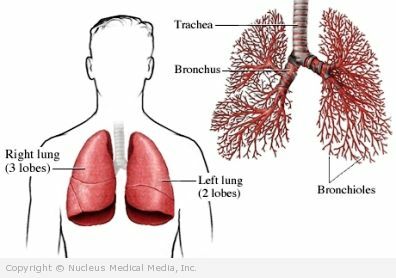 Air passes to the lungs through airways called bronchi. Bronchitis is swelling of the bronchi. It can make breathing difficult. Acute bronchitis — This is a sudden onset of symptoms. It only lasts a short time with a full recovery of lung function. Chronic bronchitis — This is a serious, long term condition. It causes blockage and damage of the lungs. It is often the result of many years of cigarette smoking. This fact sheet focuses on acute bronchitis. You may also have other cold or flu symptoms such as slight fever, sore throat, and nasal congestion. There are some concerns about the safety of over-the-counter cough and cold products in children. The FDA recommends that these products should not be used in children less than 2 years old and supports not using them in children less than 4 years old. Antibiotics will not be helpful if the infection is caused by a virus. Most of these infections are caused by viruses. If you are diagnosed with bronchitis, follow your doctor’s instructions. Avoid exposure to irritants in the air.